Every Pearson English Reader is built with you—one of the most important users—in mind. As well as varied, inviting stories that learners love, our Readers are filled with optional extra practice materials you can choose from to help students improve and measure their progress along the way. Our teacher support materials are backed by rigorous research and adhere to global standards, to ensure they cover important learning areas like reading skills, reading comprehension, phonics skills, listening and vocabulary building. You can now download a complete set lovely learner achievement certificates for Pearson English Readers, one for each level. Interested in more details about Grammar for each Pearson English Readers level? The language guidelines represent a rigorous language system unique to Pearson English Readers. Vocabulary lists are drawn from a range of significant English language databases, in particular the Longman Corpus Network, which includes the British National Corpus. Grammar guidelines are based on the latest Council of Europe specifications and the most popular Pearson coursebooks. Download the Grammar Contents to learn more. Need support materials for a specific title? Finding teaching support materials like Teacher’s Notes, Worksheets and more for a specific Pearson English Reader is a simple process! Looking to order a new set of Readers for your classroom? With experts located all over the world, we can help quicker than you think. 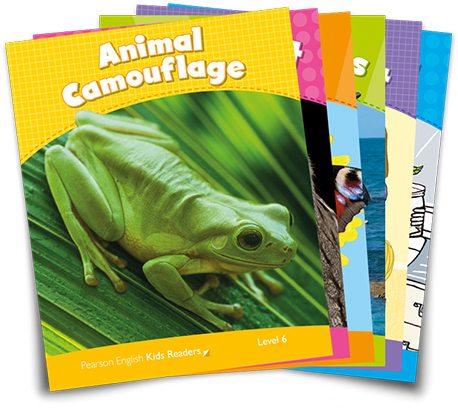 Contact a Pearson English Readers representative today to order new materials for your class. Pearson English Readers - Award-winning, carefully-levelled stories with full audio files and teacher materials with every book for in-class and self-study use. Pearson English Readers - Intensive reading experience with additional assessment, reading comprehension activities and progress tests in the book and on the packaged CD. Content Language Integrated Learning (CLIL) Readers help kids discover the world around them and build their vocabulary through topics such as art, science, and geography, presented in English. Did you know you can use Pearson English Kids Readers together with Big English Plus? We’ve carefully selected popular Kids Readers to enhance each unit in the Pupil’s Books and complement the Big English course—your students will never get bored with their course material! Perhaps one of our most popular resources is Longman’s Children’s Picture Dictionaries. Sign up online to get access today. Looking for a little English teaching inspiration? Read the Pearson English blog. From exclusive interviews with ELT experts like Jeremy Harmer to fun English learning quizzes, our blog is a great resource for both English teachers and English language learners.